S2 E1 ‐ Kimmy Goes Roller Skating! Titus's ex-wife sues him for spousal support. Kimmy still has feelings for Dong. Jacqueline's Sioux family gets fed up with her. S2 E2 ‐ Kimmy Goes on a Playdate! Kimmy helps Jacqueline put her life back together after the divorce. Titus donates his old clothes and makes a connection with a construction worker. S2 E3 ‐ Kimmy Goes to a Play! Titus develops a one-man show about his past life as a geisha. While Jacqueline tries to make Julian jealous, Lillian battles gentrification. S2 E4 ‐ Kimmy Kidnaps Gretchen! Kimmy stages an intervention when ex-mole woman Gretchen joins another cult. Titus takes Mikey the construction worker on his first gay date. S2 E5 ‐ Kimmy Gives Up! S2 E6 ‐ Kimmy Drives a Car! Hipsters invade the neighborhood when Titus rents his apartment on Airbnb. Kimmy finally reaches her limit with Jacqueline's self-centered attitude. S2 E7 ‐ Kimmy Walks Into a Bar! Jacqueline's gala plans hit a snag when Deirdre Robespierre throws a party the same night. Kimmy stops to pee at a bar and meets a cute Army vet. S2 E8 ‐ Kimmy Goes to a Hotel! On Fake Christmas, Kimmy and Dong take a trip to the Poconos, and a Jewish family claims that Jacqueline's prized Mondrian is rightfully theirs. 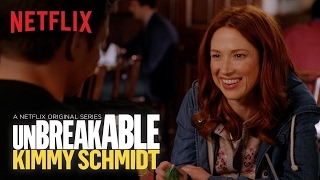 S2 E9 ‐ Kimmy Meets a Drunk Lady! A drunk Uber passenger convinces Kimmy to stop repressing her emotions. Meanwhile, a broken R. Kelly cassette tape pushes Titus over the edge. S2 E10 ‐ Kimmy Goes to Her Happy Place! S2 E11 ‐ Kimmy Meets a Celebrity! S2 E12 ‐ Kimmy Sees a Sunset! Kimmy tries to help Andrea with her drinking problem. Jacqueline dates a pro bono lawyer for his money. Titus and Mikey talk about moving in together. S2 E13 ‐ Kimmy Finds Her Mom! While Kimmy reunites with her mom at Universal Studios, Titus heads to Miami. Jacqueline invites Russ and his family to Thanksgiving dinner. Tired of being Jacqueline's assistant, Kimmy moonlights as a Christmas elf and an Uber driver. Titus finds love, and Lillian fights gentrification.